How to Cure Milk Allergy! The adverse immune reactions to cow’s milk proteins can range from immediate, potentially life-threatening reactions to chronic disorders. Cow’s milk allergy (CMA) is the most common food allergy in infants and young children, affecting 2–3% of general population. That’s a lot of kids! Most studies have shown the prognosis for developing tolerance to cow’s milk to be good, with the majority outgrowing their allergy by age 3 years. Because no treatments are available to cure or provide long-term remission from food allergy, allergen-specific treatments and strategies that attempt to alter the allergic response to specific food allergens are expected. The approach that attracts a significant interest in the scientific community, as well as the public and media, is oral immunotherapy (OIT). IgE must be demonstrated to the food in question. That means skin testing or blood tests. Who wants to be cured? That’s what desensitization accomplishes. If you gradually increase the amount of offending food (milk powder for instance), sensitive patients will no longer react to an accidental ingestion. Pretty cool…but wait, that’s not all! Permanent tolerance, as illustrated, means are you protected from ingestion of milk when you haven’t had exposure for say 2 months? Because it’s not known how to predict whether patients develop tolerance, this procedure of OIT is not recommended for clinical use at this time. Almost all children receiving oral desensitization (OIT) experienced allergic symptoms during the protocol that primarily involved urticaria and angioedema. That’s mild and treatable. Staden et al. , CM and egg CM 14; egg 11; control group 20; age 0.6–12.9 years 9/35 (36%) permanent tolerance; 3/25 (12%) tolerance with regular intake (desensitization); 4/25 (16%) achieved partial tolerance The first randomized clinical trial of OIT. The rate of spontaneous food allergy resolution in the control group (7/29, 35%) was similar to the treatment group. Longo et al. , CM CM 60; 30 active group; 30 control group; age 5–17 years 11/30 (37%) tolerated 150 ml f CM; 13/30 (53%) tolerated 5–150 ml The first study including children with previous anaphylaxis to cow’s milk; 3 children 10% discontinued the study because of severe systemic reaction. 17/30 children of active group reported side-effects at home. Skripak et al. , CM CM 20; active to placebo; ratio 2 : 1; age 6–21 years 12 (92%) of active group reached the dose 5140mg of CM (range 2540–8140 mg); no change in the placebo group The first double-blinded, placebo-controlled clinical trial for OIT; the median frequency of side-effect was 35% in the active group compared with 1% of the placebo group. Pajno et al. [19•], CM CM 30; active to placebo; ratio 1 : 1; age 4–13 years 10 (76%) of active group tolerated 200 ml CM; no change in the placebo group The first blinded trial with the weekly up-dosing regimen carried out in 18 weeks. Two children (15%) of active group discontinued the trial because of systemic reaction. Legend for the above table: CM, cow’s milk; OIT, oral immunotherapy. Desensitization state can be achieved by approximately 36–92% of the children treated with specific immunotherapy; the rate of permanent tolerance is unknown. An alternative route of allergen delivery is through an epicutaneous patch (EPIT). CMA was confirmed by an oral food challenge at baseline. Children received three 48-h applications (1mg of skimmed milk powder or 1mg of glucose as placebo) through a skin patch each week for 3 months. EPIT-treated children had a trend toward an increased threshold dose in the follow-up oral milk challenge. There was no change in the placebo group. The most common side-effects were local pruritus and eczema at the site of EPIT application. The possibility of the appearance of adverse events or reactions during OIT is quite frequent. Side-effects have been reported by patients in all trials. Severe systemic side-effects have been reported with either rush schedule or weekly up-dosing regimen. The frequency of serious events and the severity of reactions are greatest on the initial days and least on the days following desensitization when high doses of cow’s milk intake are reached by patients. Mild reactions such as abdominal pain, throat pruritus, gritty eyes, watery eyes, transient erythema and sneezing usually do not require stopping desensitization. On the contrary, when rhinitis, dyspnea, asthma, generalized urticaria and hypotension occur as a single symptom or in combination, OIT should be postponed or stopped. A life-threatening asthma reaction caused by desensitization to milk was described by Nieto et al. Adverse events are largely unpredictable, and they can occur during home dosing. Several systemic reactions have occurred at previously tolerated doses in the setting of exercise,viral illness and suboptimally controlled asthma. Of note, these reactions had been well controlled by antihistamines, steroids or epinephrine. Because desensitization( s) place patients at risk for systemic reactions, it is not appropriate to implement OIT in clinical practice settings at this time. Therefore, OIT can be performed for research purposes or as ‘avant-garde’ and modern therapy for IgE-mediated food allergy in specialized pediatric centers. Patriarca G, Nucera E, Roncallo C,et al. 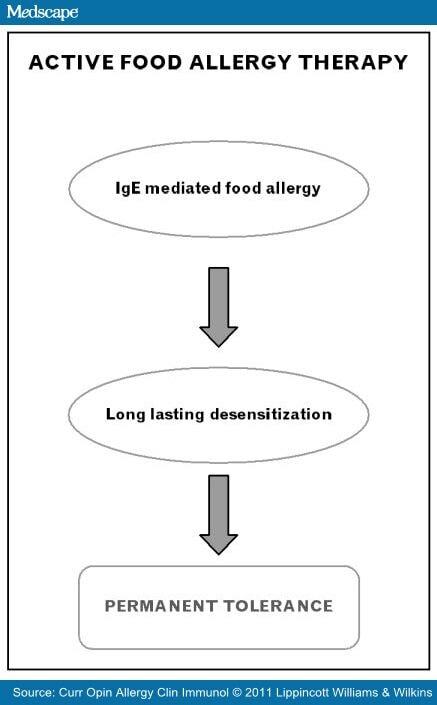 Oral desensitizing treatment in food allergy: clinical and immunological results. Aliment Pharmacol Ther 2003; 17:459–465. Nieto A, Fernandez-Silveira L, Mazon A, Caballero L. Life-threatening asthma reaction caused by desensitization to milk. Allergy 2010; 65:1342–1343.